Does Name Helps in Overseas Business? "A rose by any other name would smell as sweet" is a frequently referenced part of William Shakespeare's play Romeo and Juliet, in which Juliet seems to argue that it does not matter that Romeo is from her rival's house of Montague, that is, that he is named "Montague." 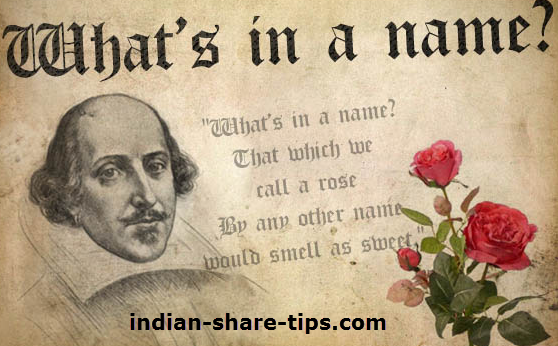 Shakespeare has rightly stated that "What's in the Name"; however it makes sense to change the name as per the local culture and traditions. Thus do spend some time while changing the name or for naming a new enterprise. This conversation in Whatsapp by one of our partner who is based in USA will help you to arrive at a correct conclusion. "Raj it is much easier to pronounce. Some people call me Raji. There is one famous American player by the name Raji Williams. Rajiv Gandhi had put my name on global stage and old timers still remember him. So some people just call me Rajiv. Life is much easier if you choose an American name. You don't have to spend first five minute of the conversation for them to know your name and it harder for them to remember a foreign name. If you are in sales and expecting people to call you back then you definitely want a name that they can remember. I know am Indian insurance agent whose business increased many times when he changed his name from Rakesh to Rick. He struggled a lot before the name change but after he became Rick he got lot of business." Do remember to get free stock market tips in your email by subscribing for free email newsletter. We do not spam as we respect your privacy.